JCS Plumbing and Heating Limited - Central Heating Engineer, Plumber based in Carshalton, Greater London. 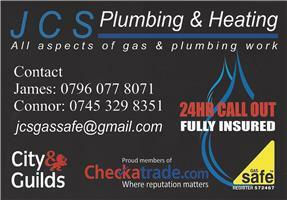 JCS Plumbing & Heating, is a family run business based in Carshalton with extensive experience in Plumbing & Heating. We are Gas Safe registered and all work undertaken by us is fully insured and guaranteed. We specialise in servicing and repair of all makes of boiler with experience in repair and maintenance of older boilers needing heat exchanger replacement.